But it really ended up that the meddling moratorium, which essentially would establish a "cooling off" period during which discrimination would still be legal, wasn't the reason the special session disintegrated into chaos. Phil Berger in the Senate could have passed whatever he wanted to pass -- he has a veto-proof majority of Republicans -- but too many Senate Republicans feel very affectionate toward their ability to discriminate against people, so they were never going to vote for repeal anyway. And don't even get us started on the NC House, where the fiercest bigots hang out with that paragon of virtue, Jonathan Jordan, and where passage of repeal was going to be even harder than in the Senate. All I want for Christmas is a functional state government. Berger (and probably Speaker of the House Tim Moore) blamed Roy Cooper for the debacle (because, right! Roy Cooper has that veto-proof majority in the Senate). McCrory blamed "well-funded left-wing interest groups," because who else are you gonna blame when you're a pile of soiled laundry waiting to be shipped out for washing? Everybody blamed the City of Charlotte, which should never have tried to negotiate with these people in the first place. But Democrats never learn about giving a toe to the crocodile. Republicans had victory in hand, having bullied the Democrats (Charlotte City Council) into repealing their pro-trans, LGBT rights ordinance. Then Republicans gave victory away by failing to repeal HB2, which they'd always said was passed only because Charlotte's ordinance needed to be blocked. Turns out, HB2 is Republican policy and has zero to do with Charlotte. It has everything to do with the Republicans' anti-gay bigotry. HB2 remains on the books, businesses and events (NCAA etc.) continue to boycott North Carolina, and the blame is now 100% on the Republicans. It always was, of course, except that the Republicans used to be able to point an accusing finger at Charlotte. Now, they can't. They own this stinking mess, and the stench is all over them. Nice going, Republicans, you're even dumber than I thought -- and I did think you were pretty damned dumb. If the law helps to keep perverts out of public restrooms where my daughter or grand daughter are it's fine with me. If you keep bending over for perverts they're going to give you what you deserve. Of course you're an anonymous commenter. Both a coward and a moron. All 16 Democrat state Senators voted against repeal of HB2. Any one wonder why? And BTW, the Governor continues to announce new corporate locations and expansions, even in his lame duck status. 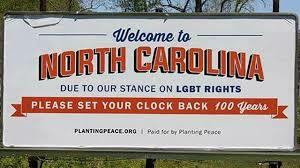 It will be interesting to see if Governor-elect Cooper promotes the continued economic expansion that has occurred here for the past four years or if he tries to appease the LGBT bullies and their allies on the left who support a boycott of NC. All 16 Democrat state Senators voted against repeal of HB2 because it included Phil Berger's poison pill provision that kept restrictions on municipalities in place. The Dems offered a bill that completely repealed HB2 - Berger wouldn't allow it to go to the floor for a vote. Berger, Moore, and the GOP are the bullies here, using LGBTs as a political football to stir up their evangelical and bigoted base. Thank you for showing how hateful and ignorant the left can be. Democrats always call for "civility" and "reason" yet when confronted with an opposing opinion their true nature of rudeness and hostility always comes out. Republicans never call for "civility" and "reason" because it impedes their chosen voice of "hate" and "ignorance". So you are adopting Republican tactics? Then you are just like them, congratulations.